Custom surfboard art, Skye Schuchman. Arteriors Home Zebi Accent Table, The Mine. Four days after our cross-country move to the Bay Area, my husband went to an estate sale and stumbled upon our new home. 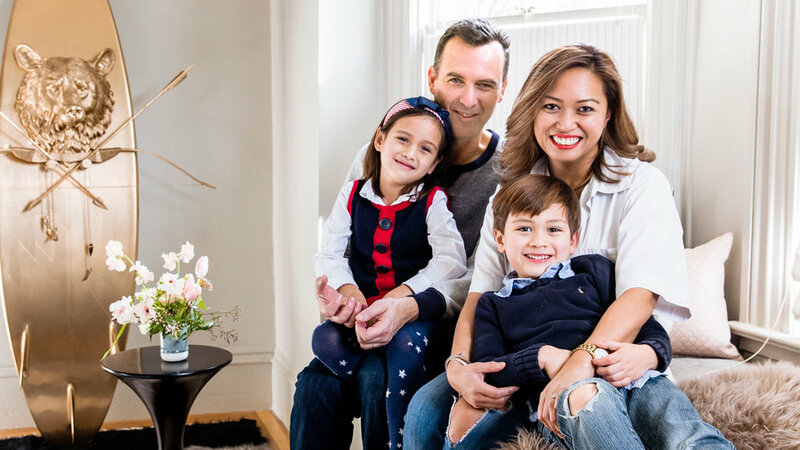 This unbelievable stroke of real estate fortune came at a price: Without any previous experience, we found ourselves enmeshed in a gut remodel of an almost 140-year-old house with knob-and-tube wiring, outdated plumbing, six layers of wallpaper, and an attic full of rats. Clearly, we were in over our heads. Fireplace paint, Cubist Gray (SW 1022), Sherwin-Williams. Nuevo Living Theo Shelving Unit, The Mine. So we called in the experts: architect Ethan Andersen of Oakland’s Drafting Cafe, who reconfigured key spaces into rooms fit for a contemporary family, and interior designer Lynn K. Leonidas (right), who provided the clarity and discipline to keep my quirky decor tendencies in line. Out of necessity more than anything else, my husband took on the role of general contractor, tutoring himself with YouTube construction videos and turning into a DIY master. One year and a whole lot of sweat equity later, our old house has been given new life with its original character intact. 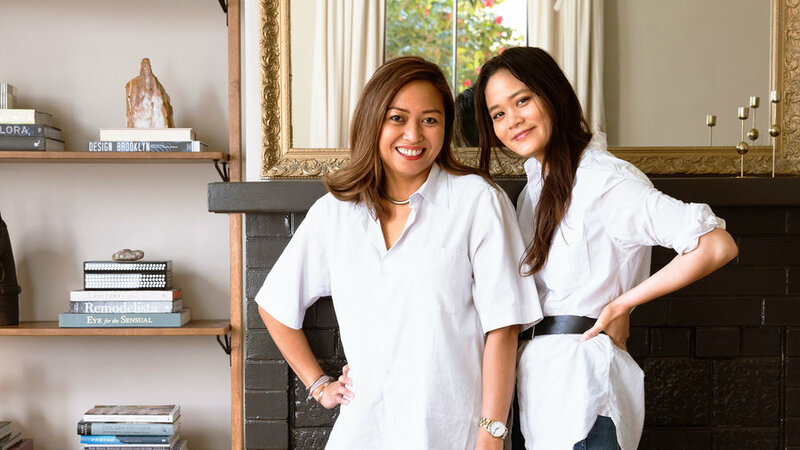 Check out our home’s new look, and tips from our designer. Drapery in Suit Stripe, The Shade Store. GroovyStuff Back to the Roots Atlantis Coffee Table, The Mine. Generous windows and 11-foot ceilings add graceful scale to the 2,400-square-foot home. To counteract the formality of our family hand-me-downs and vintage pieces bought at auction, we chose simple wood bookshelves to flank the fireplace and a conversation starter of a coffee table hewn from a teak root stump. 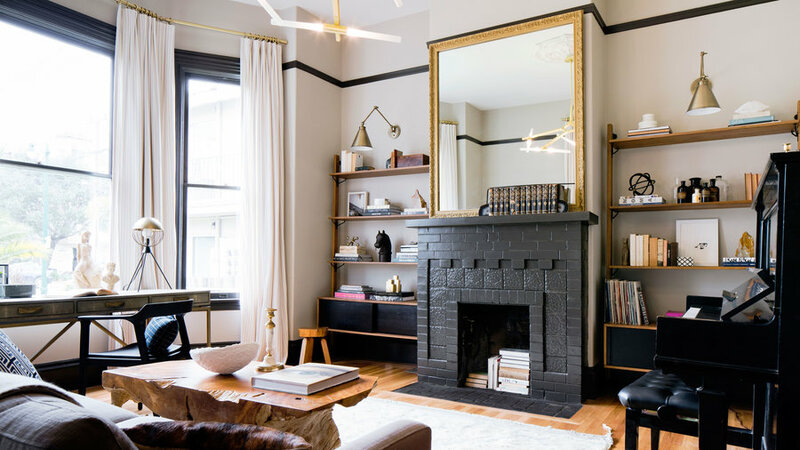 The dark trim color is repeated on the fireplace surround and throughout the house—a leap-of-faith design decision that I would unhesitatingly make again. Swing-arm sconces cast a library-style spotlight on beloved old books. Crystal Cove Print by Stephanie Vovas. Cello 1 by Joseph Knowles, Jr., available through Zoe Bios Creative. A large-scale print by Los Angeles photographer Stephanie Vovas commands attention over the 1908 Steinway my husband found on Craigslist. In the background, an abstract black-and-white piece by Santa Barbara artist Joseph Knowles Jr. holds court in the entry. We found an expert handyman online to hang art on our delicate plaster walls through the services marketplace Thumbtack. DCS ActiveSmart Refrigerator, 36-in Dual Fuel Range, and 36-in. Pro Hood, DCS Appliances. Arteriors Home Warren 4 Light Linear Chandelier, The Mine. 3-In Square Field Tile in Shell, Fireclay Tile. Because my husband cooks for a living, this is the most used space in our home. But the original configuration felt cramped, with a low ceiling and a breakfast room separated by French doors. Our architect removed those doors and reconfigured the kitchen into three zones: a cooking area with a prep sink, a nook for everyday meals, and a larger sink area for cleanup. Removing the dropped ceiling revealed almost three extra feet of height—a feature we showcased by adding shiplap ceiling finish, pendant lights, and a library-style ladder. DishDrawer Dishwashers, DCS Appliances. 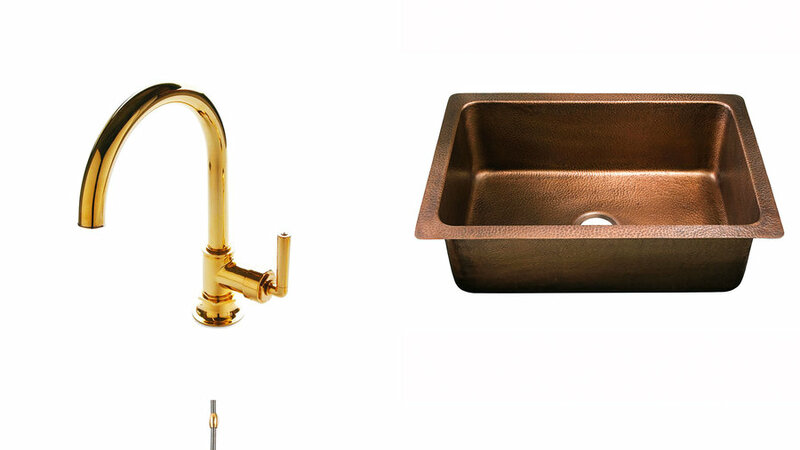 Henry One Hole Gooseneck Kitchen Faucet in Unlacquered Brass, Waterworks. Sakura Handpainted Winter Mountain Tiles, Fireclay Tile. We avoided recessed lights in the high ceilings and brought the lighting downward to highlight features closer to eye level. We layered statement pendants over areas like the kitchen island and breakfast table. 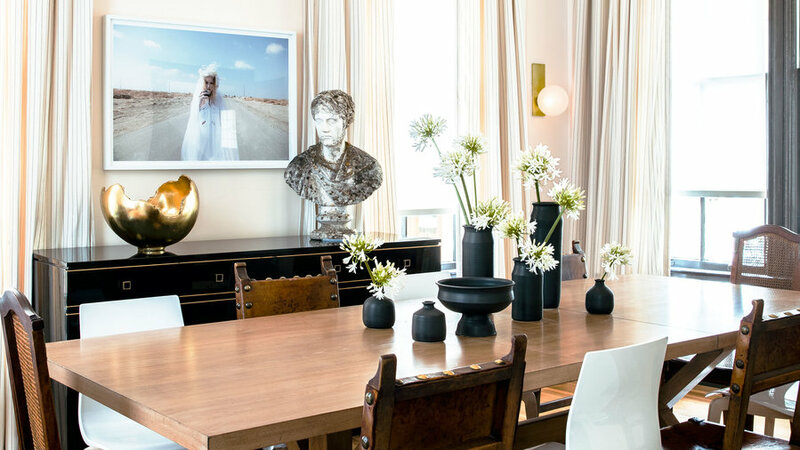 Don’t be afraid to mix metals—just stick to your selections throughout the house for a cohesive look. Roman shades in Wool Blend, The Shade Store. Altamont Large Pendant in Distressed Bronze, The Mine. Casual family meals take place on a window seat with custom leather bench cushions that conceal extra storage. Roman shades in heather gray felted wool complement the adjacent wall covered in floor-to-ceiling field tile. Ivory cabinetry in this area represents a subtle shift from the soft gray in the main cooking space. Lexington Home Brands Monterey Sands Walnut Creek Dining Table, The Mine. In a space used for frequent entertaining, our goal was to design a room that could skew informal or grand. Drapery from The Shade Store is mounted above the trim to emphasize the high ceiling; motorized Somfy shades can be lowered singly or in unison. 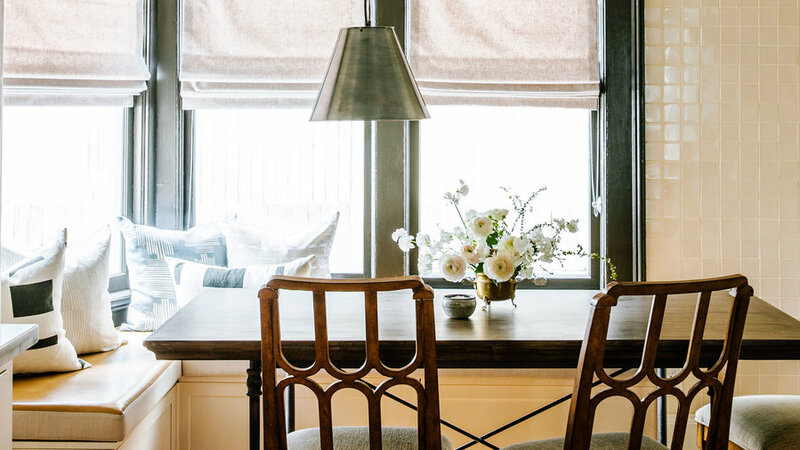 A mix of old and new chairs adds interest around a classic farmhouse table. Kelly Wearstler for Ann Sacks Tableau Crescent Deco Field Tile in Chrome Mineral, Ann Sacks. Attention-getting tile from the stellar Kelly Wearstler for Ann Sacks collection amps up the glam factor. 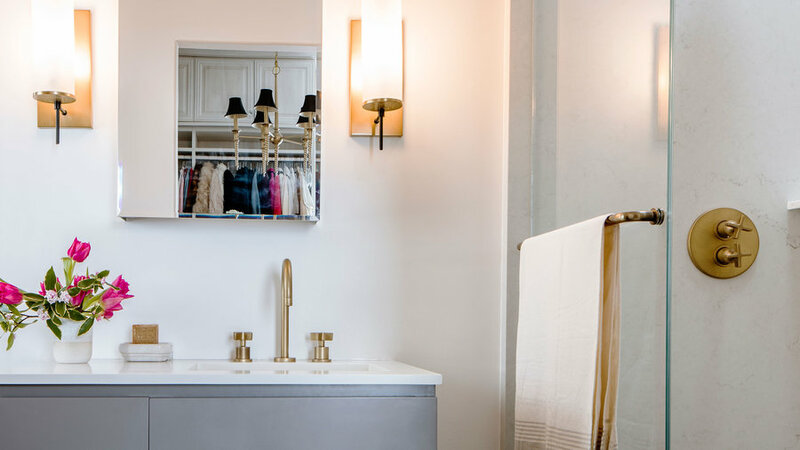 A simple floating sink allows the brass sconces and mirror to shine. J&M Furniture Premium Sofa Bed, The Mine. 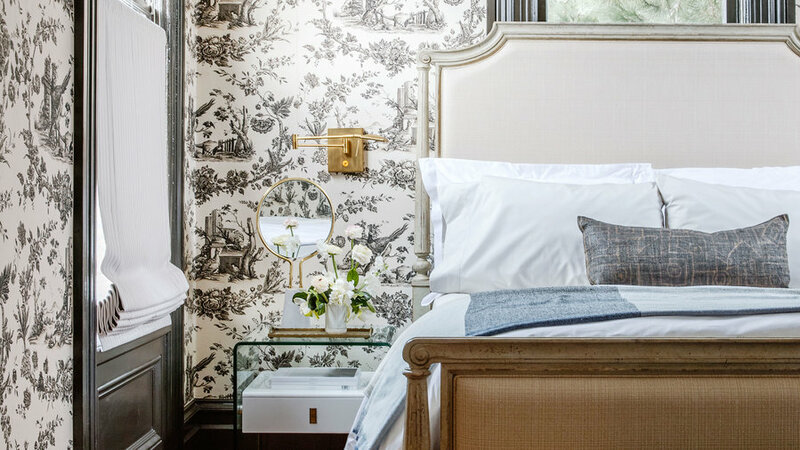 Thibaut wallpaper in embossed vinyl creates a textured canvas in the guest room. 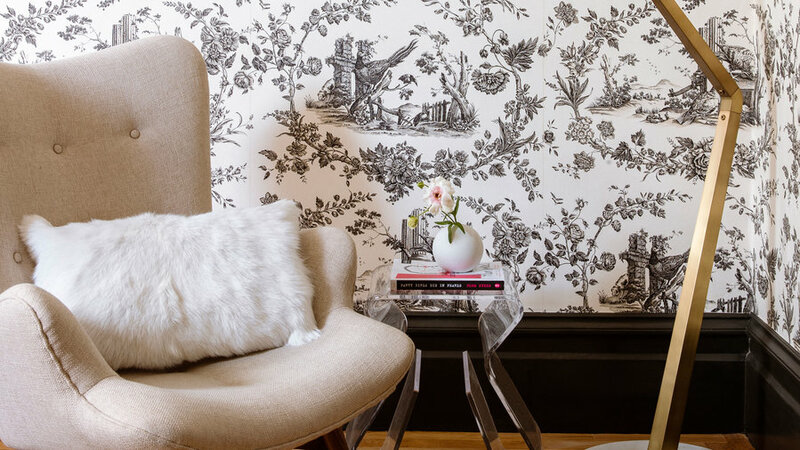 Pheasant Toile Wallpaper in Black, Thibaut. Roman Shades in Suit Stripe, The Shade Store. Stanley Furniture Arrondissement Palais Upholstered Bed, The Mine. My longtime toile obsession has finally found its home. 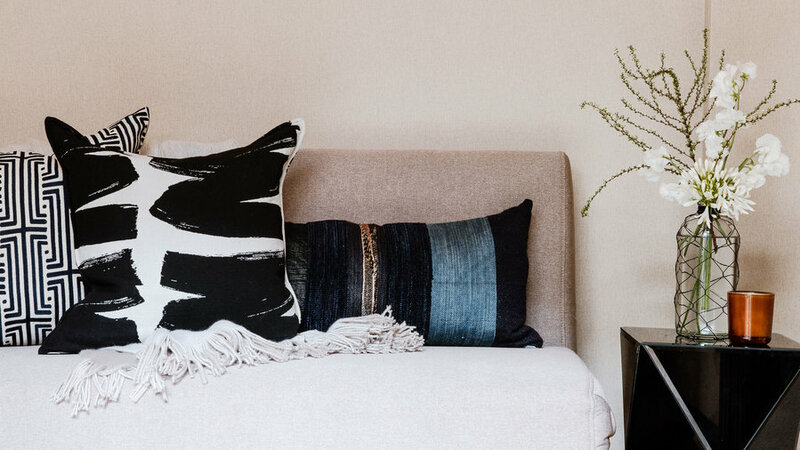 We toned down the ultrafeminine look with Roman shades in a simple pinstripe, solid bedding, and a reading nook composed of a midcentury-style armchair and a swing-arm floor lamp. Arteriors Home Juniper Floor Lamp, The Mine. We used the dark trim to emphasize the ornate details distinctive to Victorian architecture. The trim is a dark gray, and it’s paired with off-whites and a middle gray color as an accent. There are no bright whites; all the colors share a warm base. Ronbow Vanessa 36-In Wall Hung Bathroom Vanity Base Cabinet, The Mine. 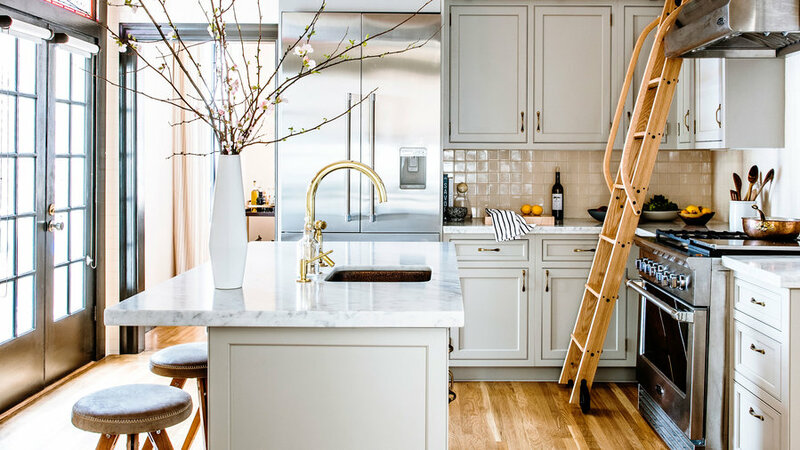 This petite space packs a punch with two-tone floors composed of different kinds of Caesarstone. A third style forms the shower surround. Graydon Double Wall Sconces, Rejuvenation. What was once a Victorian-era “fainting room” is now a luminous space for leisurely evening soaks. 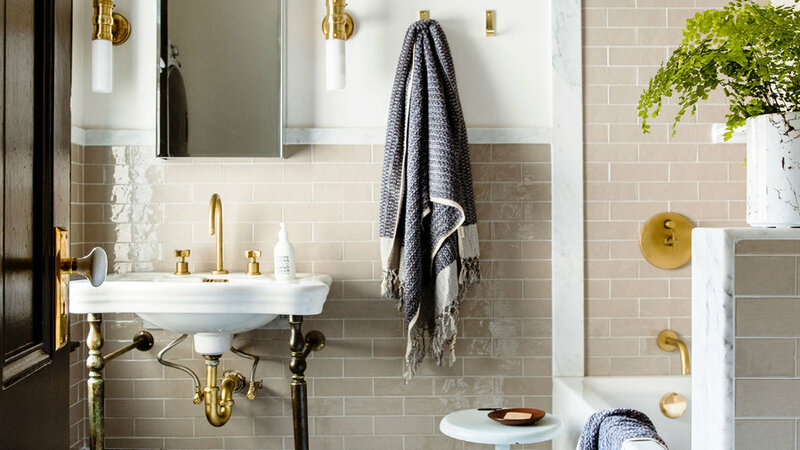 Strips of Carrara marble delineate a wall of mink gray subway tile set off by shower fixtures from Rejuvenation in an aged brass finish; fish-scale mosaic tile adds interest on the floor. The old-fashioned sink was repurposed from the downstairs bath and moved into a room where it has more space to breathe. Skyline Furniture High Arch Nail Button Velvet Bed, The Mine. 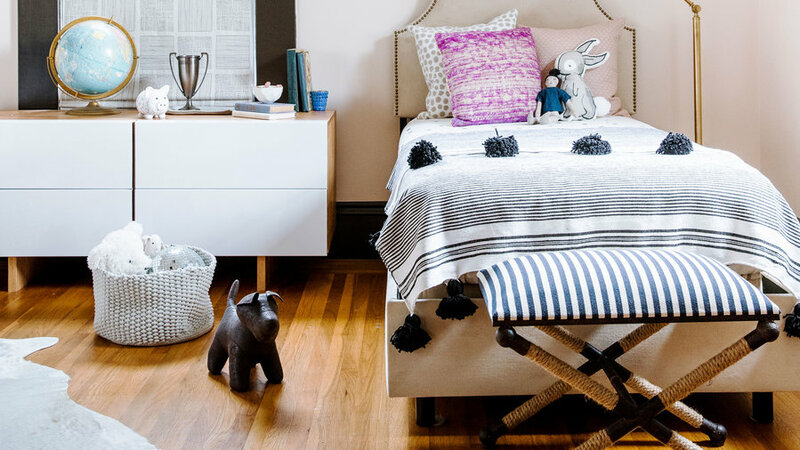 Nautical stripes and Roman shades set the neutral, versatile style for the bedroom shared by my 6-year-old daughter and 5-year-old son. We chose to emphasize texture (a rope chandelier, a pale cowhide rug) and playful Old World accents such as a vintage globe and trophy. Elfa Custom Closet System, The Container Store. 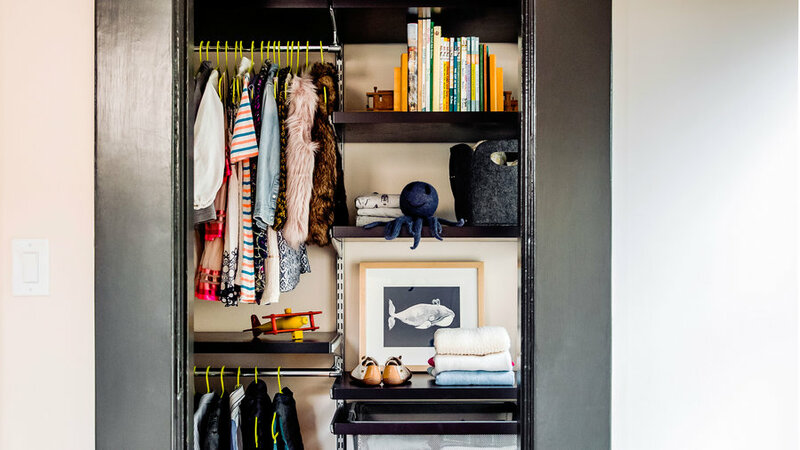 A closet configured in the Container Store’s Elfa system keeps clothes organized and creates room for displays of artwork and treasured toys. Thibaut Sunbrella Interlude Fabric, Thibaut. Honor the existing architectural style and the era in which the house was built when selecting fixed finishes such as tile and cabinetry. 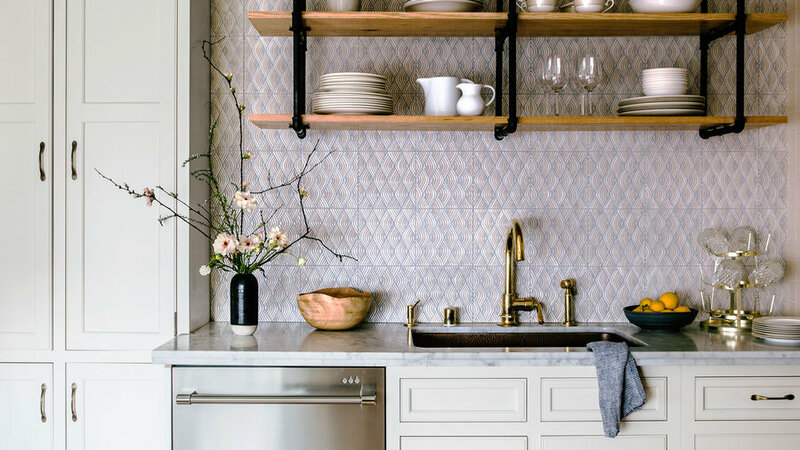 Fixtures that are easy to change out, like lighting, are the appropriate place to experiment with a mix of styles.